← Gaslighting: Did Trump’s Own Lawyers Leak the Memo He’s Accusing the Justice Dept of Leaking? I don’t think Rudy understands this lawyering thing. You are supposed to maintain that your client is innocent, you shouldn’t keep implicating him. 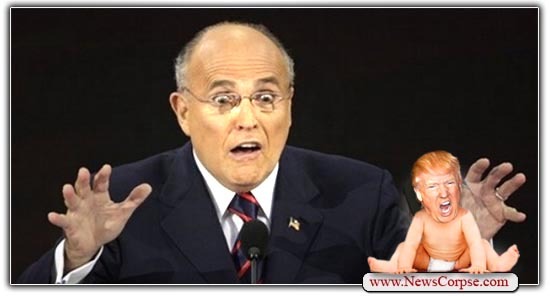 Let’s just say whatever the Uncool Ghouliani’s talents as a lawyer, he’s making a hell of a Court Jester! This would be funny if it weren’t so scary: Hair Drumpfenfuhrer’s public voice is now a mindless nutjob made world famous thanks to a tragedy he did not stop and could not fix — and so completely clueless that he will say anything without any clue how he has just dug his Beloved God and Master into an even deeper grave. And the God’s worshipers will swallow the slime up wholesale while making every excuse in the book how this PROVES it’s all Hillary’s/Obama’s/the Deep State’s/Fill in the Blank’s fault and that their God is the most brilliant and perfect human being who ever existed. Now all we need is for Caligula the God to appoint his horse to the Senate (he has already demanded his Roman triumph in the form of the parade no one is mentioning any more), and Rudy will be right there to justify every move, which the God’s worshipers will accept as if the God had just rid the planet of every terrorist. Ever since 9/11Giuliana has lost his marbles. Now this ^&%$#$%^& expletive deleted , spurts out convoluted illogic to make less sense than does trump! This is what we have finally achieved after so many years of trying? A cartoon show of how incomptetent, inept wacky people are put into the powerful drivers seat of running a country? Just to unbelievable even if it were a comedy on TV. The Un-united States of the Banana Republic of America. WOW!! !